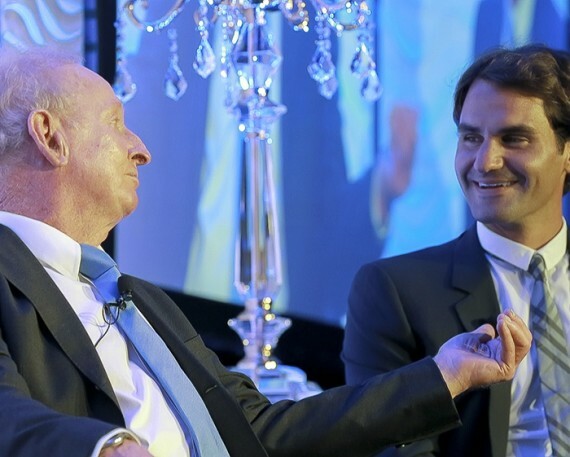 Here is the video released by Brisbane International 2014, filmed at 'The greatest dinner of all time' which was attended by Roger Federer and Rod Laver. Rupert McCall recites his new poem, The Masterpiece, about a dream tennis match between two of the greatest players, Federer and Laver. I must admit I found it to be rather emotional. Roger looks so handsome, doesn't he? I wasn't sure what to make of the poem myself. I thought both Roger and Rod looked slightly embarrassed by the whole thing. It's not every day you have to sit there while a poem about yourself is recited. Both players, being humble guys rather than deliberate attention seekers, looked slightly embarrassed when the camera focused on them under these circumstances and I felt at one point Roger seemed to be tearing up a little. Roger Federer and Rod Laver on how to play each other..
That's a great little discussion. Thanks for posting it Sausan. I'm now going in search of this morning's doubles on youtube. Didn't get to watch any of it. Thank you for posting the video Sausan An interesting chat between Rod Laver and Roger Federer ~ discussing how the game has changed and how they would approach playing eachother. I also missed the doubles (in the early hours) this morning so look forward to seeing it when it appears on YouTube. It sounds as if it was a very close match.